So Wednesday afternoon (after work to be precise) I had a chance to meet with my mother-in-law. I had been having trouble getting my cutie-patootie Hello Kitty branded sewing machine to work. I would thread the needle, try to sew, the thread would break. I would try the tension, the thread would break. Someone said, hold the thread when you start, I did. The thread would break. See a theme here? So off to my mother in law's house. We get in, set up the machine and she threads it. Viola! It works. I mean, its like she had the magic touch or something. I felt silly but my husband assures me that she has like 50 yrs sewing experience. In reality, its just easier for some people then it is for others. I compared it to the difference in using a spinning wheel. I can sit down to any spinning wheel and produce a yarn. It might not be great, I might not like the wheel, but I know the mechanics and how it should work. In contrast, someone who has never spun their own yarn would have serious difficulties. The only difference I see here is that there are tons of self taught spinners who have posted all kinds of things to the web. 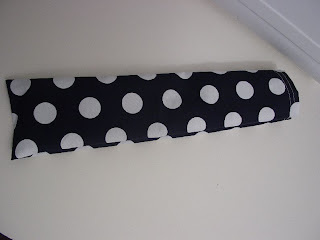 With sewing, I think people take for granted the ease of access that people have to learn on there own. 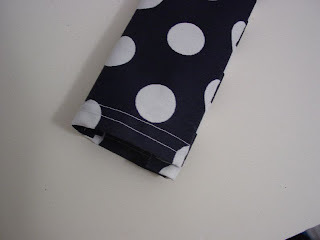 Thus, not as much easy access information for newbie sewing people on the web. Well, then, whats a blog post without pictures. I did know enough to do a double stitch on the top. That's me being fancy. Oh and then to top it all off. 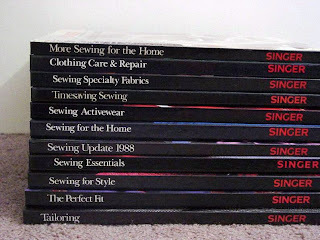 My mother-in-law gifted me with some Singer sewing books that she was given a few years back. With 50 years sewing experience you don't really need them do you. I think this should be fun for a little while .... or until I have to rethread the needle and/or bobbin. Whichever comes first.